Address: M.G. Road, Agra, 282002 India . Access: 10 Kms. from Airport;8 Kms. from Railway Station;5 Kms. from Bus Stand . Facilities: Standard rooms with room facilities such as telephone, coffee / tea maker, morning newspaper Services: Doctor on call, Fax, Safe Deposit, Laundry, Travel Desk Service, Money Changer, Car hiring, Internet . The hotel's 148 rooms and suites, with a choice of non-smoking rooms, are tastefully furnished to provide you the very best of relaxation. In-room facilities include individual climate control, telephone with voice mail, International Direct Dialing, round the clock room service, hair dryers, mini bars, 24 hour satellite entertainment, 4 channel music and carefully selected personal care products which are standard in every room. Olive Garden, the Multi cuisine restaurant offers a unique blend of international cuisine from around the world. Overlooking the lush green front lawns of the hotel it provides an ambience which is warm yet trendy. It seats 70 people in all comfortably and provides a memorable dining experience. The open terrace pool, with a beautiful garden and equipped with a bar plus an evening barbeque, provides the perfect ambience for complete relaxation. Golf lovers can enjoy a golf session at the Agra Golf Club specially arranged by us.Fitness centre is equipped with the latest equipment and a Hi tech multigym for those who want to sweat it out, With separate sections for ladies and gents, the fitness centre is also equipped with Steam, Jacuzzi and Massage. What do you think about Holiday Inn Agra? We stayed at this hotel for 1 night as part of the Golden Triangle tour, and therefore had no say in which hotels were booked for us. The location was poor and there seemed to be no where to eat nearby. As a result, we had no option but to eat in the hotel. The food was of reasonable quality but it was expensive. The room was clean and the general service was adequate. We discovered a major problem with the fire exits. When we were looking for the swimming pool, another guest told us to go along the corridor and out of the fire exit. We did this and the double set of fire doors closed behind us. We then discovered that we had come out of the wrong fire exit but couldn't get back in the same door from the outside - fair enough. So we found the main stairwell (fire escape) leading to ground floor fire exit. This stairwell was blocked with rolled up carpets and chairs. With no other way of getting back in to the hotel, we clambered over the carpets and chairs and made our way down to the ground floor, and reached the main exit. However, to our astonishment, this exit was locked! We banged on the door but no-one heard us. Our only option was to make our way back up to our floor and wait to be rescued outside another fire door with windows. Eventually I made a telephone call via the UK to our adjacent room in the hotel who kindly rescued us. God help the guests should there be a fire. We reported this to reception upon checking out - they seemed disinterested in our comments. 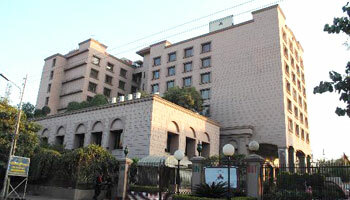 We stayed here as part of Delhi-Agra-Jaipur route package. This hotel is more of 2.5 star hotel rather than 4 star that it claims to be. We had no bathtub and it looked like the bathtub has been ripped out previously with no effort to make it look like otherwise, with marks on the tiles where it used to be. The shaving plug sockets in the bathroom was hanging out exposing about 2 inches of electrical wire. It was quite noisy due to roads below but I would say that is something that you would expect from staying in Agra. There were a few stains on one of the pillowcase cover and the bedsheets but everything was very clean and staff were generally friendly and helpful. We really liked this hotel. The rooms were nice, the staff polite, etc. Room service was good - the restaurants ok. We were disappointed that they didn't start serving dinner until 7:30 pm as we were traveling with our young daughter. Breakfast was very good (and included). However the location left much to be desired. There wasn't really much nearby within walking distance. During a trip to India, my group stayed for two nights at the Holiday Inn Agra. The trip had been long and stressful, so staying at such a comfortable and familiar hotel was a treat. The rooms were clean and cozy - in fact, I would say that this is an above average Holiday Inn. The gift shops downstairs were better than shopping on the street. The hotel held a New Year's Eve party that was enjoyable and safe. The staff was very accommodating to our needs and room service was prompt. One of our group members got sick while in Agra and the hotel quickly found a doctor for us. If you go, bring ear plugs - there are packs of feral dogs outside of the gated hotel complex that get quite loud at night. That's the only blemish to a perfectly enjoyable stay. A note: there are two restaurants in the hotel, one called The Olive Garden and another called Curry Centre. The Olive Garden is NOT the same as the chain of the same name in the US. The Olive Garden at the Holiday Inn Agra is a buffet style restaurant that features a mixture of Indian and non-Indian foods. I stayed just 1 night at the hotel, and left really early. There room was clean, but had the "usual" lack of attention to details that are frequent in (Indian) hotels. Loose sockets, incontinently located hangers and so on. Nice bed, nice linen, good sofa. The beauty parlor was not good. Manicure and henna hand tattoo was very low quality. The indian restaurant was not bad. I didn't try the breakfast as I had to catch a flight early in the morning. Stayed there long time back, but enjoyed the stay thoroughly!! The hotel staff was courteous and made arrangements for whatever we asked for. The rooms were big enough and clean. We could see the Taj in the morning when it was not hazy right from our room. I would recommend people to try this Holiday Inn as its not so expensive and has good customer service and all what a hotel should have.. Stayed here 13th-15th April. We were actually booked to stay only one night but extended our stay for another night as we liked the hotel so much. Definitely above average Holiday Inn, very nice and comfortable, with good service. As we needed two double rooms, we were given interconnecting rooms which seemed bigger than the standard rooms, though when we arrived the reception staff couldn't find my reservation, which I had booked using the holiday inn website. This took a while to sort out, but was resolved finally, however got the impression that the reception staff were quite inefficient but the rest of the staff made up for it. Food was great and there are two restaurants on-site, an indian one and a continental one, where after two weeks of spicy food we were just so glad to be able to get some pasta! Breakfast (buffet) is included and was good especially with a chef making omelettes to order as you wait. All in all a very good hotel with very reasonable rates. Only downside is that you can hear all the noisy Agra traffic from the rooms, but Agra itself in particular is not a very nice place, very dirty and congested. While not a particular fan of Holiday Inns in the US, I found this place sufficiently "Indian" and very pleasant. The staff was particularly helpful and friendly and the room was well-appointed and comfortable. I stayed there for two nights and had the buffet breakfast which I thought was fine. Quite a bit to choose from...traditional Western and Asian selections. I would recommend this place.